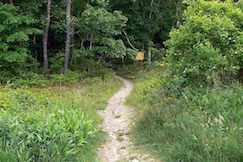 Our Cape Cod trail listings are extensive, including driving directions, trailhead/parking area photos, maps (when available), descriptions and nearby bike shop contact info. The bike shop database is organized by town. With literally hundreds of miles of dedicated bikeways running through forests, marshland, rivers and coastline, Cape Cod is truly a biker’s paradise. Summer and into the fall are perfect times to take advantage of the numerous trail networks scattered throughout this region, and the relatively temperate winter climate allows the truly dedicated to ride throughout the winter. We also have a listing of Cape Cod Books that cover outdoor activities as well as other Cape Cod interests.